Irish Gifts - Full Color Shamrock Shaped Irish Jigsaw Puzzle with Cottage, Celtic Cross and More! Sorry, this Irish puzzle is sold out. Made in the USA! of soy-based inks and recycled board. Recommended age - Adult. 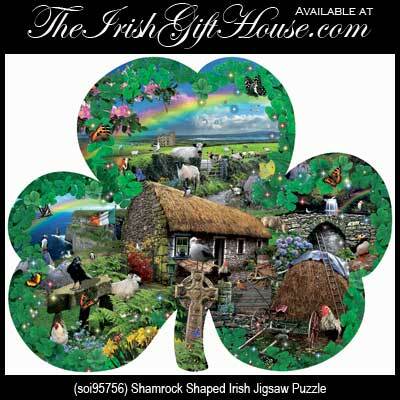 Irish Gifts - Shamrock Shaped Irish Jigsaw Puzzle with Cottage, Celtic Cross and More!.